Perfect for Wall-mounted applications as well as desk surface configurations. The LLTM30-B is the perfect solution to charging and securing up to 12 tablets (sold separately). 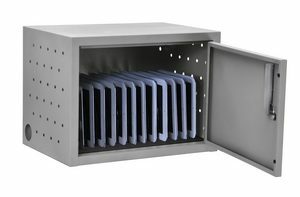 Use this lockable tablet charging wall cabinet to securily store and charge up to 12 tablets. Divider Dimensions: 6"H x 8"D x 1". Please check before ordering if your device will fit.